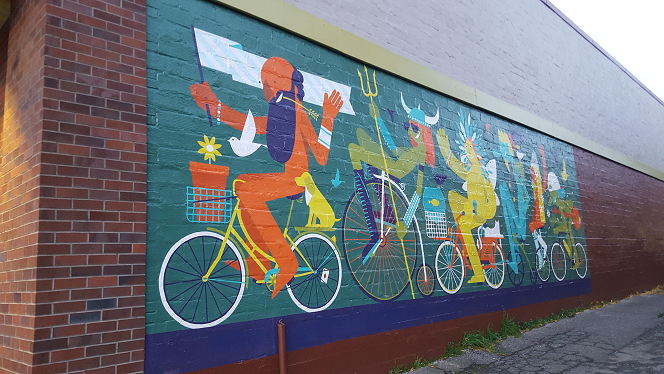 Marketime Foods mural on Fremont Ave.
“Beginning in July 2017, the Seattle Department of Transportation has allowed private companies to deploy free-floating bike share bikes in Seattle. We are the first U.S. city to regulate this model, and we are eager to understand what worked, what didn’t, and what could be improved. “As part of our evaluation, we are reaching out to Fremont Neighborhood Council to solicit your comments and suggestions on the free-floating bike share program. We want to know more about how you and the communities you serve have experienced the bike share program since July, and what you would like to see in the future. We are especially interested in exploring and addressing barriers to access and other equity issues. The feedback we collect will inform our evaluation report and guide policy development for a potential ongoing program. “If you, your colleagues, or the communities you serve would like to provide any comments or suggestions about the bike share program, simply reply to this message or use the contact information below. We’re also conducting a web survey about the program, and we appreciate your help distributing it to as many Seattleites as possible. If we should direct feedback requests to another contact person in the future, please let us know so we can update our outreach records. “Thanks for all the great work you do in our community, and we look forward to hearing your thoughts on this bike share program.